Column caps and bases have been widely accepted as a form architectural beauty. Typically composed of two to three parts, column caps feature an echinus (the part with a molded design), an abacus (The flat slab at the top) and sometimes a neck. 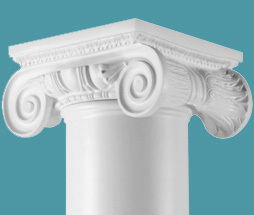 The most common designs of column caps are derived from a classical order from Roman and Greek architecture. Today, there are four commonly recognized orders of classic Roman/Greek architecture; the Doric, Ionic, Corinthian, and Tuscan. Of course, these are not the only designs, but are by far the most common. At Decorative Architectural Shapes, our experts can mold any of the classical designs and can even create a custom design to your specifications. 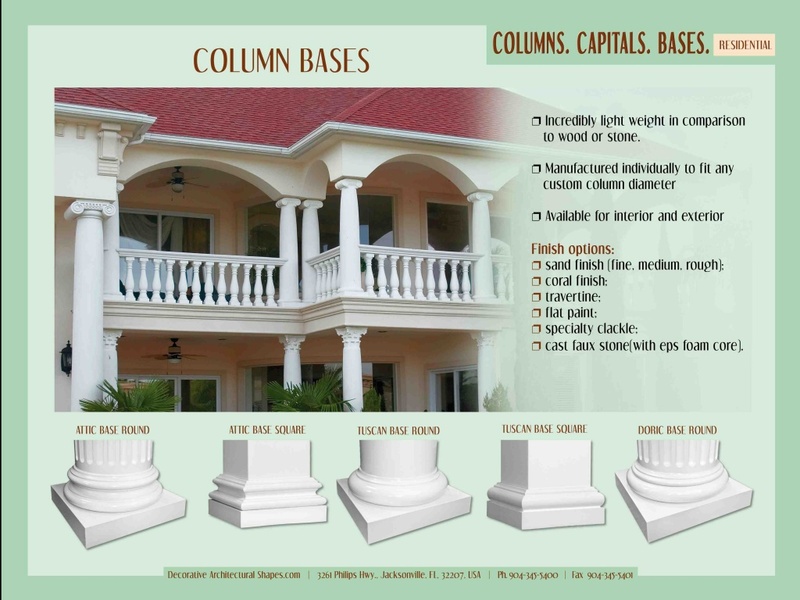 Column caps and bases cultivate the decorative movement and flow that is among the most desirable elements in modern architecture. With Decorative Architectural Shapes, you will find that creating such an atmosphere is as easy as it is affordable. The only thing our customers should be concerned about is the style of their caps and bases. Sometimes choosing the appropriate style for the project in mind can be overwhelming. Considering the details of the classical designs can help you arrive at a decision, or can provide you with ideas for your own custom design. Take for instance the Doric order. It features grooves all around the neck, stretching from the base to the cap, a round saucer shaped echinus and a flat abacus. Perhaps your specifications require a sleeker appearance. Then the Ionic design is ideal in this instance. The distinguishing characteristics of this design include a tall slender neck and two decorative scrolls protruding from each end of the echinus. Take the preferred style of today into consideration as well. 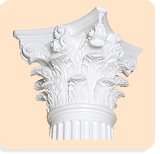 The Corinthian style bears a narrow fluted neck with ornate scroll and flower carvings. It genuinely captures that desirable effect of movement and flow. Lastly, of the four classical orders still recognized today, the Tuscan style remains to be the most simple. Its echinus is smooth all the way around and is separated from its column by a simple protruding ring. It also features and equally simplistic abacus. The combination of styles is endless. Hopefully, after considering the more popular designs, it will help you decide what look is best suited for your project. The Dorian Greeks developed the Doric capital. It is the oldest in the three main orders of classical Greek architecture and its derivatives. 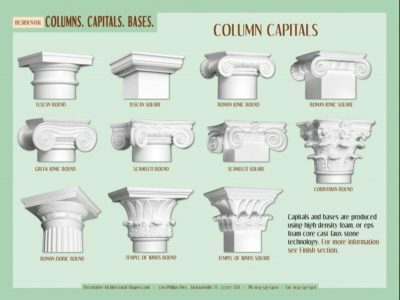 Doric capitals tend to be simple, short and saucer-shaped capitals, with no base. 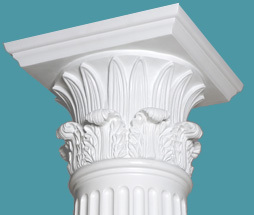 Most often used to top heavily fluted or plain columns, the Doric capital consists of three parts: a simple neck, a convex echinus and a square abacus. 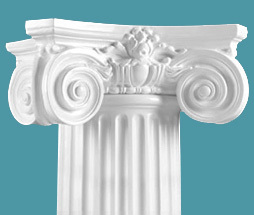 The Ionic style came from eastern Greece is slightly more decorative than the Doric. 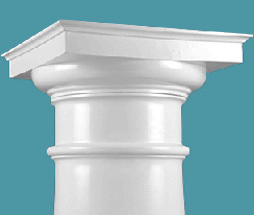 Ionic capitals usually top tall slender columns with large bases that often look like a set of stacked rings. 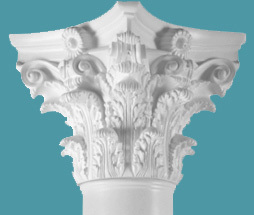 The distinguishing characteristic of Ionic capitals is the use of two opposed decorative scrolls above the shaft. The echinus itself is decorated in an egg-and-dart motif. The Corinthian order is the most decorative of the Greek orders and is the preferred style today. It features slender fluted columns with strikingly ornate inverted bell-shaped capitals bearing two rows of carved flowers and leaves with four small scrolls. 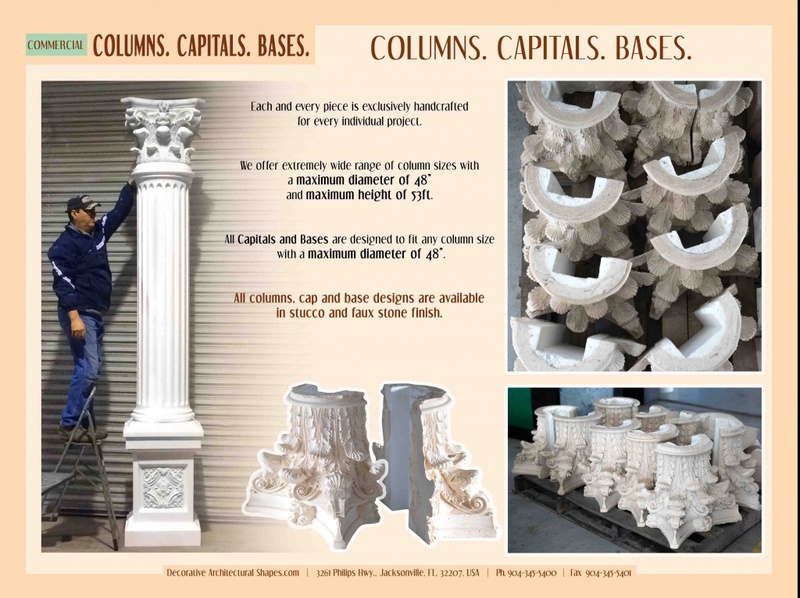 Our Tuscan and Doric capitals and Tuscan and Attic bases are cast from the same rock hard composite material as our column shaft assuring maximum durability. This is a superior material that can withstand punishment from snow shovels, pressure washers, weed eaters, and general wear and tear. 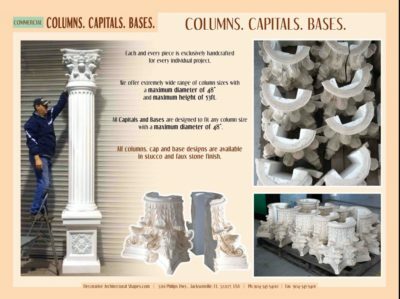 Although casting capitals and bases from this material requires extra attention to detail, we think you will agree it is worth the effort. Not only do caps and bases serve a structural purpose, but they also radiate a decorative accent. 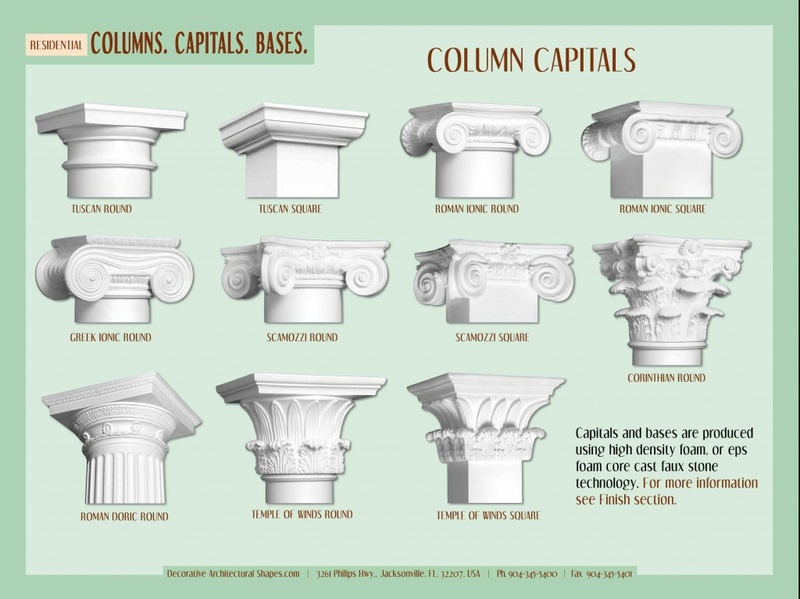 Without detailed caps and bases, columns have little decorative value and lose the desirable fluidity. Please do not hesitate to inquire about a potential design for your own caps and bases. Decorative Architectural Shapes would be pleased to guide you through the fabrication process to create any custom design to your satisfaction. MAKE SURE TO CHECK THIS PAGE TO CHOOSE A PERFECTLY MATCHING COLUMN! Caps can be used in both interior and exterior structures as support or as a decorative accent to frame an enclosure. 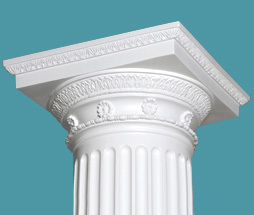 Without a base, a column is simply a naked element. Bases create a transition point between the column and the floor.